For other uses, see Marriott (disambiguation). Marriott International, Inc. (NASDAQ: MAR) is an American multinational diversified hospitality company that manages and franchises a broad portfolio of hotels and related lodging facilities. Founded by J. Willard Marriott, the company is now led by his son, Executive Chairman Bill Marriott and President and Chief Executive Officer Arne Sorenson. 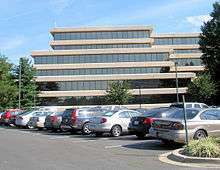 Marriott International, headquartered in Bethesda, Maryland in the Washington, DC metropolitan area, has more than 5700 properties in over 110 countries and territories around the world, over 1.2 million rooms (as of September 23 2016), and additional 195,000 rooms in the development pipeline. Marriott was founded by John Willard Marriott in 1927 when he and his wife, Alice Sheets Marriott, opened a root beer stand in Washington, D.C. As a Mormon missionary in the humid summers in Washington, D.C, Marriott was convinced that what residents of the city needed was a place to get a cool drink. The Marriotts later expanded their enterprise into a chain of restaurants and hotels. They opened their first hotel, the Twin Bridges Marriott Motor Hotel, in Arlington, Virginia, in 1957. Their second hotel, the Key Bridge Marriott in the Rosslyn neighborhood of the same city, is Marriott International’s longest continuously operating hotel, and celebrated its 50th anniversary in 2009. Their son, J.W. (Bill) Marriott, Jr., led the company to spectacular worldwide growth during his more than 50-year career. In March 2012, at age 80, he turned the CEO responsibilities over to Arne Sorenson, while he assumed the title of Executive Chairman. 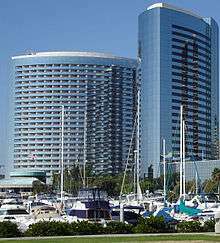 Marriott International was formed in 1993 when Marriott Corporation split into two companies, Marriott International and Host Marriott Corporation. In 1995, Marriott was the first hotel company worldwide to offer guests the option to book reservations online, via the company's implementation of MARSHA (Marriott's Automatic Reservation System for Hotel Accommodations). In April 1995, Marriott International acquired a 49% interest in Ritz-Carlton Hotel Company LLC. Marriott International believed that it could increase sales and profit margins for The Ritz-Carlton, a troubled chain with a significant number of properties either losing money or barely breaking even. The cost to Marriott was estimated to have be about $200 million in cash and assumed debt. 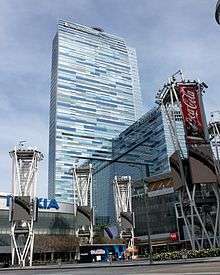 The next year, Marriott spent $331 million to take over The Ritz-Carlton, Atlanta and buy a majority interest in two properties owned by William Johnson, a real estate developer who had purchased The Ritz-Carlton, Boston in 1983 and expanded his Ritz-Carlton holdings over the next twenty years. The Ritz-Carlton began expansion into the lucrative timeshare market and undertake other new initiatives made financially possible by the deep pockets of Marriott, which also lent its own in-house expertise in certain areas. There were other benefits for Ritz-Carlton flowing from its relationship with Marriott, such as being able to take advantage of the parent company's reservation system and buying power. The partnership was solidified in 1998 when Marriott acquired a majority ownership of The Ritz-Carlton. Today, there are 81 Ritz-Carlton properties around the world. 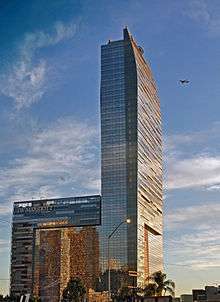 The Marriott World Trade Center was destroyed during the September 11, 2001 attacks. U.S. Republican presidential candidate Mitt Romney released his 2011 federal income taxes on September 21, 2012, showing that he declared $260,390 in director's fees from Marriott International, despite the fact that news was released on January 13, 2011, that he had already stepped down from the Marriott International board to run for president. His had released 2010 tax returns showed earnings in 2010 of $113,881 in director's fees from Marriott. In February 2012, Bloomberg reported on Romney's years overseeing tax matters for Marriott, which had included several "scams" (quoting Sen. John McCain) and legal actions brought against Marriott, which Marriott lost in court, over its manipulations of the U.S. Tax Code. On October 3, 2014 the US Federal Communications Commission (FCC) fined Marriott $600,000 for unlawful use of a "containment" feature of a Wi-Fi monitoring system to deliberately interfere with client-owned networks in the convention space of its Gaylord Opryland Resort & Convention Center in Nashville. The scheme disrupted operation of clients' mobile telephone hotspots by sending fraudulent Wi-fi de-authentication packets. Marriott International, Inc., the American Hotel and Lodging Association and Ryman Hospitality Properties responded by unsuccessfully petitioning the FCC to change the rules to allow them to continue the wilful jamming of client-owned networks, a position which they were forced to abandon in early 2015 in response to backlash from clients, mainstream media, major technology companies and national mobile carriers. The incident drew unfavorable publicity to Marriott's practice of charging transient lodgers $13–15/day for wi-fi connections, routinely included in the base price at most discount chains, and to exorbitant wi-fi fees (typically $250–1000 per device) charged to convention-goers at a time when the $2.25 billion annually in ever-increasing "incidental fees" charged by US-based hotels to their lodgers was already drawing criticism and negative media coverage. On January 27, 2015, Marriott acquired Canadian hotel chain Delta Hotels. Delta operates 40 hotels in Canada. On 16 November 2015, Marriott announced the acquisition of Starwood Hotels and Resorts Worldwide for $13 billion. The deal was closed on 23 of September 2016 and is the world's largest hotel company. The acquisition will give Marriott a larger non-US presence; approximately 75% of Starwood’s revenues are from foreign markets. The acquisition is the largest of its sort since 2007, when Blackstone acquired Hilton for $26 billion. There is a $400 million breakup fee if the transaction is not completed. Executives noted that total transaction and integration expenditures may exceed $100 million. A competing offer for Starwood at $14 billion from a consortium led by China's Anbang Insurance Group was announced March 3, 2016. In March 2016, Starwood announced it would cease the deal with Marriott and pursue the offer from Anbang Insurance Group. After Marriott raised its bid to $13.6 billion on March 21, Starwood terminated the Anbang agreement and proceeded again with the merger with Marriott. Following all necessary regulatory approvals in the United States and around the world over the course of 2016, Marriott closed the merger with Starwood on September 23, 2016, creating the world's largest hotel company with over 5700 properties, 1.1 million rooms and a new portfolio of 30 brands. The hotel is noted for providing copies of the Book of Mormon in addition to the Holy Bible in its rooms. In 1984, Marriott disposed of its theme park division; both parks were sold and today are associated with national theme park chains. The Gurnee location was sold to Six Flags Theme Parks where it operates today as Six Flags Great America. The Santa Clara location was sold to the City of Santa Clara, who retained the underlying property and sold the park to Kings Entertainment Company, renamed Paramount Parks in 1993. From 1993 to 2006, the Santa Clara location was known as Paramount's Great America. In 2006, Paramount Parks was acquired by Cedar Fair Entertainment Company; the Santa Clara park operates today as California's Great America. In the years after their sale, the layouts of the parks have diverged substantially. Marriott Rewards is the guest loyalty program that offers travelers their choice of points toward free vacations and merchandise or frequent flyer miles, as well as other membership benefits, when staying at Marriott brand hotels worldwide. Frequent travelers also can earn “elite level” benefits with Marriott Rewards, including room upgrades, bonuses, and gifts. There are three “elite” levels—Silver, Gold and Platinum – each based on the number of nights stayed at Marriott hotels each year. In September 2014 Marriott International and Maria Shriver, founder of the organization called A Woman's Nation, announced a new initiative titled "The Envelope Please." This new campaign makes an attempt to get their customers to tip the housekeeper who cleans their room. Tipping these individuals is an alternative way to help rather than giving them a raise. The average U.S. Marriott housekeeper starts at minimum wage and makes approximately US$8.50 per hour. Marriott will now place envelopes in 160,000 hotel rooms in the U.S. and Canada, urging its customers to tip the housekeepers. Roughly 750 to 1,000 hotels will take part in the envelope campaign from Marriott brands like Courtyard, Residence Inn, J.W. Marriott, Ritz-Carlton and Renaissance hotels. 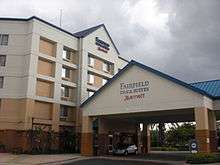 The program has drawn concerns that reclassifying housekeepers as tipped employees could be used by hotel management in future as a pretext to reduce their base pay, a pattern which has already widely occurred with tipped restaurant staff; the envelopes have also drawn objections that Marriott should improve employee remuneration itself instead of displacing the issue onto the client. ↑ "100 Best Companies to Work For 2014 – Marriott International – Fortune". CNN. ↑ "Marriott Fact Book." Marriott International, Inc. Retrieved on March 18, 2016. p. 2/104: I. CORPORATE PROFILE. "Corporate Office Marriott International, Inc. 10400 Fernwood Road Bethesda, MD 20817"
↑ "JW Marriott Hotels & Resorts | Marriott News Center". News.marriott.com. Retrieved 2016-10-28. ↑ Required FieldConfirmation number (2013-05-24). "About Marriott Hotels | Marriott Corporate Business Information". Marriott.com. Retrieved 2016-10-28. ↑ "MARRIOTT INTERNATIONAL INC /MD/ (Form: 10-K, Received: 02/20/2014 13:28:17)". Secfilings.nasdaq.com. Retrieved 2016-10-28. ↑ "Remembrances of Mom - Marriott on the Move". Blogs.marriott.com. 2007-05-09. Retrieved 2016-10-28. ↑ "J. Willard Marriott". Entrepreneur.com. Retrieved 2016-10-28. ↑ "Root Beer Roots". Washingtonpost.com. Retrieved 2016-10-28. 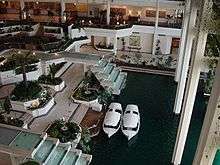 ↑ "Key Bridge Marriott Hotel Prepares for 50th Anniversary With $30 Million Renovation of Event Space - Archive". Theopenpress.com. 2008-09-26. Retrieved 2016-10-28. ↑ "Magazine Article". Forbes.com. Retrieved 2016-10-28. ↑ "History of Marriott International, Inc.". Fundinguniverse.com. Retrieved 2016-10-28. ↑ "Form 10-K". Sec.gov. Retrieved 2016-10-28. ↑ Drinkard, Jim (2005-01-17). "Donors get good seats, great access this week". USA Today. Retrieved 2008-05-25. ↑ "Financing the inauguration". USA Today. 2005-01-16. Retrieved 2008-05-25. ↑ "Some question inaugural's multi-million price tag". USA Today. 2005-01-14. Retrieved 2008-05-25. ↑ "Marriott News". Marriott.com. 2006-07-19. Retrieved 2016-10-28. ↑ "Marriott to expand India portfolio to 100 hotels". Added expansion plans. 2010-11-11. Retrieved 11 November 2010. ↑ DeLollis, Barbara (21 January 2011). "Marriott says no to adult movies in new hotels". USA Today. Retrieved 5 October 2011. ↑ Clabaugh, Jeff (2011-12-13). "JW Marriott Jr. retiring as CEO". Retrieved 13 December 2011. ↑ "Mitt Romney, 2011 Tax Return" (PDF). Efile.com. Retrieved 2016-10-28. ↑ "Mitt Romney leaves Marriott International board". Bizjournals.com. Retrieved 2016-10-28. ↑ "Mitt Romney, 2010 Tax Return" (PDF). Efile.com. Retrieved 2016-10-28. ↑ "Romney as Audit Chair Saw Marriott Son of BOSS Shelter Defy IRS". Bloomberg. ↑ "Did Romney enable a company's abusive tax shelter? - CNN.com". CNN. 2012-08-09. ↑ "Luxury Hotel in Dubai Crowned World's Tallest Hotel". Dubai Chronicle. ↑ Official World's 100 Tallest High Rise Buildings (Hotel Use). Emporis.com. Retrieved on July 5, 2009. ↑ "Marriott to pay $600,000 to resolve Wifi-blocking investigation". Federal Communications Commission. 3 October 2014. Retrieved 2016-10-28. ↑ Petition of American Hotel & Lodging Association, Marriott International, Inc., and Ryman Hospitality Properties for a Declaratory Ruling to Interpret 47 U.S.C. § 333, or, in the Alternative, for Rulemaking, Apps.fcc.gov, 2014. 1 2 "Marriott hotels do U-turn over wi-fi hotspot blocks". BBC News. ↑ Los Angeles Times (2 November 2014). "Free Wi-Fi at luxury Marriott hotels--for some". latimes.com. ↑ Los Angeles Times (31 August 2014). 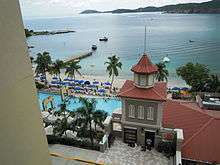 "Hotels to collect record $2.25 billion in guest fees". latimes.com. ↑ "Marriott expands in Canada by buying Delta hotel brand". thestar.com. 27 January 2015. ↑ "Marriott closes $13-billion purchase of Starwood to become world's largest hotel chain". Los Angeles Times. Associated Press. 23 September 2016. 1 2 "Breaking News: Marriott Buying Starwood for $12 Billion, Creating World's Largest Hotel Chain - CoStar Group". Costar.com. Retrieved 2015-11-17. ↑ "Archived copy". Archived from the original on 2016-03-14. Retrieved 2016-03-14. ↑ "Starwood dumps Marriott deal for competing bid". USA TODAY. 18 March 2016. ↑ Banerjee, Arunima (March 21, 2016). "Sheraton-owner Starwood accepts higher offer from Marriott". Reuters. Yahoo! Finance. Retrieved March 21, 2016. ↑ "SMarriott International Completes Acquisition of Starwood Hotels & Resorts Worldwide, Creating World's Largest and Best Hotel Company While Providing Unparalleled Guest Experience". Marriott International. 23 September 2016. ↑ Yu, Roger (2007-02-01). "Marriott says trans fats will check out". Usatoday.com. Retrieved 2016-10-28. ↑ "Marriott to Cut Trans FatAt U.S., Canada Hotels - WSJ". Online.wsj.com. 2007-02-02. Retrieved 2016-10-28. ↑ McDowell, Edward (December 26, 1995). "Bible Now Shares Hotel Rooms With Some Other Good Books". The New York Times. Retrieved 6 December 2012. ↑ "Marriott Hotel Brands | Marriott International". Marriott.com. Retrieved 2016-10-28. ↑ "Marriott Rewards | Member Benefits At A Glance". Marriott.com. Retrieved 2016-10-28. ↑ "Marriott Housekeeper - Job Description & Salary". Job-applications.com. 2014-06-20. Retrieved 2016-10-28. ↑ "Housekeeper Salaries". Glassdoor.com. Retrieved 18 September 2014. ↑ Lowrey, Annie. "Multi-Billion-Dollar Hotel Chain Encourages You to Tip Its Workers". New York Mag. Retrieved 16 September 2014. ↑ Harpaz, Beth (15 September 2014). "Envelopes in Marriott Hotels Invite Tips for Maids". ABC News. Retrieved 16 September 2014. ↑ Los Angeles Times (4 October 2014). "Marriott hotel chain pushes the envelope on housekeeper tipping". latimes.com.